In Naples Florida you will find the spectacular gated community of Quail Creek. The Estates in Quail Creek is an exclusive community of 289 single family homes situated on 640 beautifully landscaped acres. The 10 miles of tree-lined streets winding through this picturesque area boasts numerous possibilities for potential home buyers. The real estate here is luxurious with breathtaking views of the finest of fairways, glistening lakes and lush greens. Living in the Estates in Quail Creek is like living in a park bursting with amenities, making it an ideal place to buy a home. Residents enjoy easy access to country club golf, tennis and an amazing fitness and spa facility. One of the most desirable single family gated communities in Naples, Quail Creek also offers exquisite dining options for those living there. The Estates at Quail Creek is ideal in its convenient location near I-75. With quick and easy access to Naples, residents are able to enjoy upscale shopping and the best casual and fine-dining. 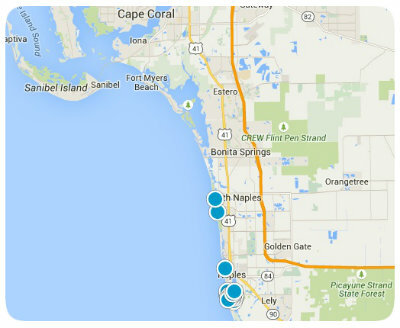 Those that enjoy travel will be pleased to find Southwest Florida International Airport is also nearby. Families will love the quality education provided by schools in the area, as well as close proximity to top-notch health care facilities. Residents of Quail Creek find peace of mind living within this private gated community with a carefully controlled entrance staffed 24 hours a day with a mobile patrol from 4:30pm until 6:00am. Nature lovers will be tickled to see Bald Eagles Swallow-tailed Kites, Red Tailed Hawks, Great Blue Heron, Snowy Egrets and many other birds gracing the fairways, waterways and woods of Quail Creek. The Southwest Florida weather provides ample opportunities for all sorts of recreational activities including walking, biking, tennis and golf. The full-service Quail Creek Country Club features not one, but two 18-hole Arthur Hills championship golf courses and 13 Har-Tru tennis courts. There are multiple other amenities, too numerous to mention, that make the Estates at Quail Creek a must-consider location when looking to buy a home in Naples, Florida. If you would like to buy a home in Quail Creek or you have other Naples real estate questions, please do not hesitate to contact us today for more information.